Militants open fire along the entire frontline in the Donetsk sector. Avdiivka and the vicinities remain the epicenter of the most intense hostilities. A private house was damaged there as a result of yet another shooting attack conducted by militants. Armed Forces of Ukraine incurred no losses yesterday, but four servicemen sustained wounds and injuries, as reported by the spokesman of the Ministry of Defense of Ukraine on ATO related issues Colonel Oleksandr Motuzyanyk during a press briefing at Ukraine Crisis Media Center. “Militants shelled our rear area, Klishchiivka village, with 152-mm cannons, launching about 80 shells. Five artillery projectiles were launched at our positions in Novobakhmutivka. The enemy widely used small arms and occasionally mortar launchers at the Svitlodarsk bulge, at the Horlivka perimeter and in the vicinity of Donetsk airport,” he said. In the Mariupol sector militants opened fire from small arms in Marinka two times, and three more times in Krasnohorivka, launching several mines at Ukrainian troops. The situation further southward was absolutely calm during the day, excluding one brief shelling from APC weapons in the vicinity of Starohnativka. Two mortar shells were launched by militants west of Dokuchaevsk. “The enemy was shooting the entire day in the south approaches to Mariupol. Russian occupational troops shelled our positions in Vodiane from mortar launchers three times, and one artillery and mortar attack took place in Pavlopil. Four houses were damaged in hostile attack in Hnutove,” informed the spokesman. 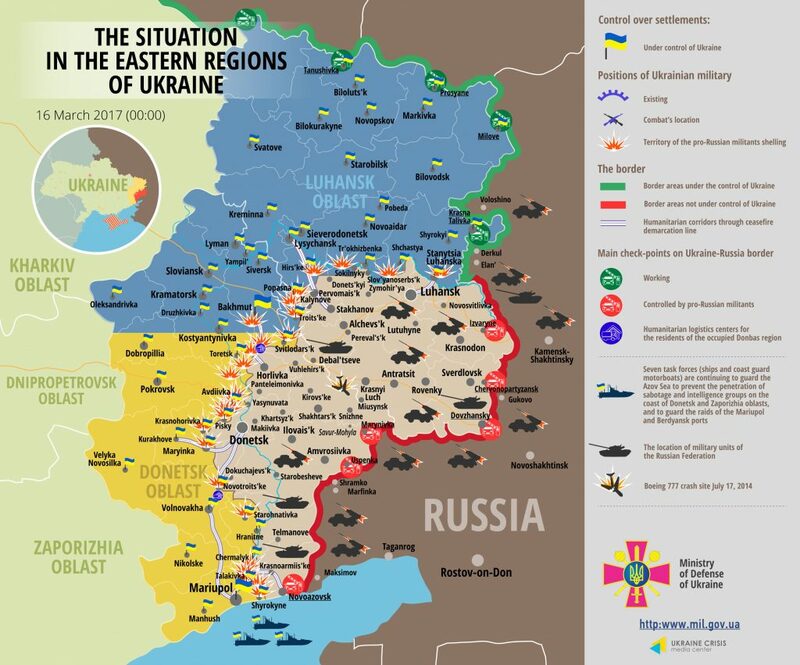 In the Luhansk sector hostilities continued in Popasna and Novyi Aidar areas yesterday. “Troitske, the outskirts of Popasna, and Krymske remain the largest flashpoints. The enemy used mortars in this area around the clock, having launched over 140 mortar shells within a day. Eight artillery shells were fired in Novozvanivka and Krymske. The armistice fully held in Stanytsia Luhanska area yesterday,” said Col. Motuzyanyk. National Security and Defense Council adopted a decision yesterday regarding full cessation of cargo traffic between the temporarily occupied territories in Donbas and the rest of Ukraine. “Such a step has been made due to mass seizure of enterprises, formerly under Ukrainian jurisdiction, by militants and representatives of pro-Russian occupational administration. The prohibition will not apply to humanitarian aid for civilian population. Moreover, civilians with their belongings and goods for personal use can still cross the checkpoints, as before, both on foot and in vehicles,” elaborated Col. Motuzyanyk.